From the ornate spiral staircase to the exquisite views and the delicately golden framed artwork, this rental emits the feeling of holidays well spent in Paris. 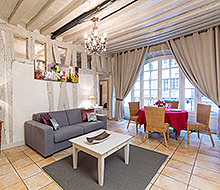 The large windows offer views of both the Seine and the Notre Dame. Staying here means you won’t for one moment forget that you are in the most breathtaking city in all the world. The living room, dining room, and kitchen are well-connected yet feel absolutely spacious. Like the rest of the apartment, these three rooms are luminous. When you aren’t peaking out the windows at Paris’ hypnotizing view, you will be delighted with all that you have inside this luxurious rental. Recently remodeled, the handpicked white leather sofa, Louis XIV armchairs, area rug, and glass table perfectly complement the space. The full white drapes are tied back with Romanesque golden ropes. This room perfectly blends classic antiques with a clean and modern color palette. Between the living room and the dining room, a red wooden case is filled to the brim with fine linens, crystal stemware, and gorgeous china. The round glass table is begging to be set. This space is so easy to enjoy a morning croissant and a café au lait or alternatively an evening meal made with fresh ingredients purchased from the Maubert Mutualite open-aired market, which is oh-so conveniently located around the corner. Between the dining room and the kitchen sliding glass windows offer an optional added level of privacy for the chef. The fully renovated crème colored kitchen exhibits a surprising amount of counter space as well as top appliances. The large refrigerator, dishwasher, and stovetop are guaranteed to please. If you stand at the sink you can see the Seine out of the dining room’s window. All of the windows offer views so spectacular this apartment feels cinematic. 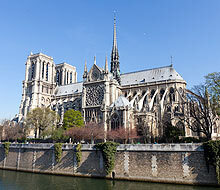 As you can see from the pictures the Notre Dame is literally just across the way. 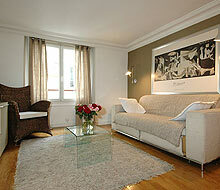 We know you want to see Paris, and electing to stay in this Luxury Paris Rental means you really will. The master bedroom is pristine. As in the rest of the apartment the hardwood floor juxtaposes delightfully with the soft color scheme. 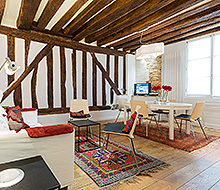 The converted queen translates into flexible sleeping options, and the built-in closet and en-suite bathroom are ideal. The en-suite bathroom features a sunflower headed shower, glass vessel sink, and a mirrored vanity. Across the hall, there is a gorgeously curtained powder room. Complete with an antique makeup table this room is the epitome of Parisian luxury. Down the hall you can find the apartment’s WC.